Scientists have identified specific extracts from cruciferous vegetables — such as broccoli, cauliflower, cabbage and Brussels sprouts — that help maintain healthy hormone levels.14-18 Maintaining optimal hormone balance is essential to any anti-aging strategy. 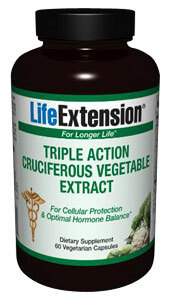 Triple Action Cruciferous Vegetable Extract combines these plant extracts into the most comprehensive food-based, plant compilation for cell protection yet. Contains corn. This product contains NO milk, egg, fish, peanuts, crustacean shellfish (lobster, crab, shrimp), soybeans, tree nuts, wheat, yeast, gluten, or rice. Contains NO artificial sweeteners, flavors, colors, or preservatives.